The last few months have seen an absolute explosion in our carpet cleaning services for Birmingham and Solihull. So much so that we have recently undertaken a price check against our competitors, just to make sure we are still competitive. Carpet cleaning is a crowded market so we always look to offer value to our customers. To offer value we need to make sure our services are competitive. 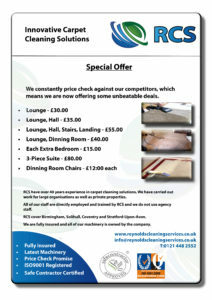 We are glad to say the RCS are still one of the cheapest carpet cleaning service suppliers around, and have been for over 60 years! 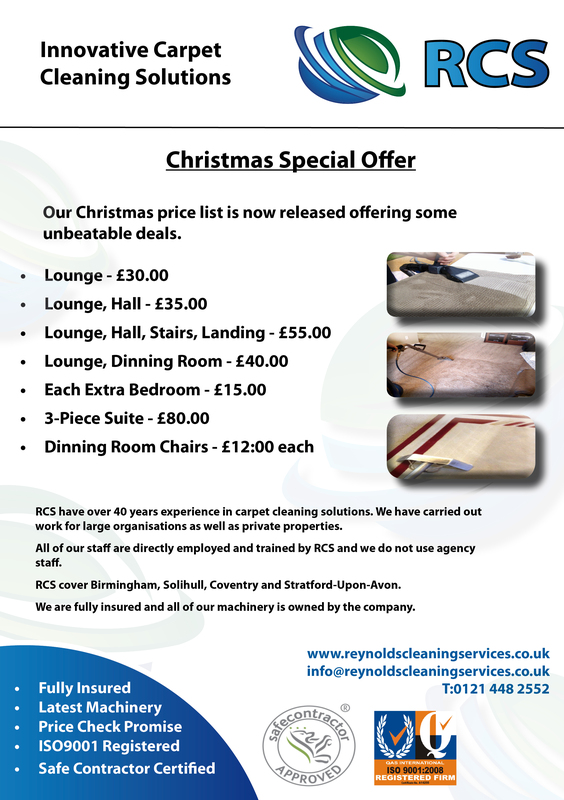 Carpet cleaning around Birmingham and Solihull was pioneered by Reynolds Industrial Cleaning (RIC was the original company to RCS) around 1956. RIC first introduced carpet cleaning to the offices of Wimbushes, a local bread making factory based in Birmingham. The industry has seen a lot of changes since those early days but, safe to say, the quality of service is still the same! Our commitment to carpet cleaning has meant we have further upgraded our machinery assets, meaning we have state of the art machines to make sure the job is done properly every time. 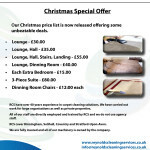 We have now released our Christmas carpet cleaning price offer with our main package, lounge, hall, stairs and landing, now cheaper than last year at just £55.00. Add additional rooms for just £20 extra! This service gets fully booked rather quickly so contact us now. 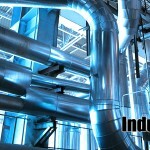 RCS are seeing a massive surge for our services in industrial decontamination sector. Along with Optimum Dry Ice Blasting (our other company) full factory clean downs can now be achieved in a quicker timeframe than even we believed! The armoury of machinery now at RCS’ disposal is ever growing and gives the company, as a whole, a forward facing ‘can do’ attitude to almost every problem we encounter. A recent example was when cleaning down a chemical factory. 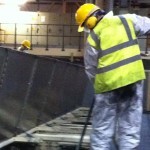 Dry ice blasting was utilised to remove the built up debris and grime found on almost every surface. However, it was ineffective in removing a gluten based residue found in a section of the factory. It was decided that our DOFF superheated system would be better used to ‘dissolve’ the build up to a capture point and then dry ice was used to finish off the deep clean. Without our knowledge of the DOFF system we would have struggled to attain a 100% removal rate, leading to an embarrassing meeting with the client! Luckily, we have the machinery and knowledge to cover just about every angle. RCS have recently won a contract to provide full factory industrial decontamination services in the Petro Chemical sector. During the initial clean down a traditional process for cleaning a machine rota, that was suggested as best method by the customer, was proving to be too slow and cumbersome. After lengthy discussions with the client, we persuaded them that dry ice blasting was a safe and quick way to descale the machinery in question. The rota is delicate in parts, and so the thought of adding high velocity blast media on to the surface, without damaging it, was quite daunting for the customer to understand. After initial tests RCS proved that dry ice blasting was best practice. Not only did the process remove 100% of scale (which the traditional method couldn’t do), it also managed it in a quarter of the time. The customer has been so impressed we have now rolled out dry ice blasting to other machinery in the factory. Through our continued investment in leading edge technology, RCS are finding more and more engineering companies are requesting our services for factory, industrial cleaning. We are inundated with calls, so much so that we are investing in more machinery as I type! We still believe that the profile of environmental cleaning needs to be raised and that eco friendly cleaning schedules should be implemented as part of the Governments ‘green deal’. This isn’t just an opinion that suits our business model, its an opinion that would suit every organisation that employs cleaners (and that’s nearly every organisation!) As part of a companies sustainability programme, eco cleaning would help achieve targets. AND it will also help the environment! RCS believe that its not all about ‘box ticking’ you see. Our ethos is that if we all do our bit, then a difference can be made.